With Father's Day around the corner (18th June) it's time to get thinking about how to make you dad's day special and memorable. 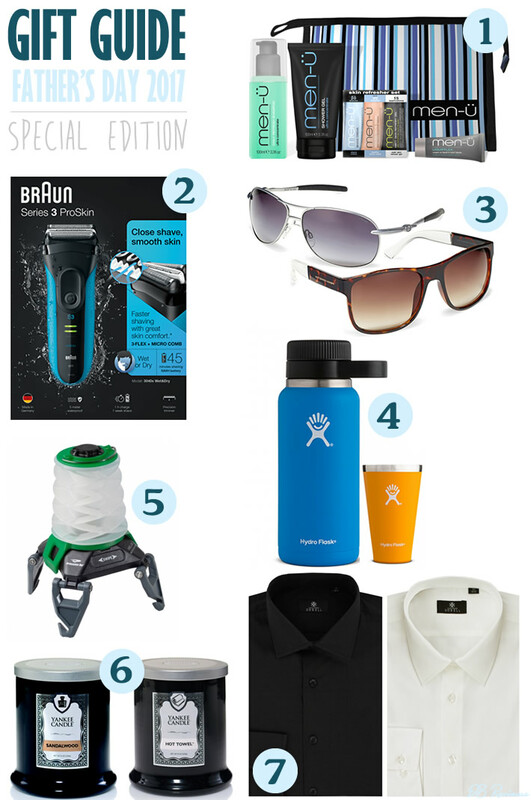 To help you out, I have put together this special edition gift guide. It features some interesting and useful products. So, go ahead and delight your dad with one of these gifts. For the dad who loves to be well-groomed is the Braun S3 ProSkin. It is a sophisticated shaving system of three independently floating cutting elements and two SensoFoilsTM that adapt to every facial contour to offer dad a comfortable shave that is faster than ever before. The shaver has an extra-large precision trimmer and an ergonomic grip which offer a gentle shave with total control. ProSkin makes use of Braun's advanced MicroComb technology - a comb-like structure that guides the beard hairs into the cutting element of the trimmer thus reducing the shaving time and in turn skin irritation. With excellent precision and great attention to detail, the ProSkin 3040s would make a very useful gift. The ProSkin 3040s is available in black, red, blue and metallic blue from Amazon.co.uk and other retailers. Next up are some fashion accessories. How about a cool pair of sunglasses for your dad? I have not one but two suggestions - a gunmetal aviator and a stylish tortoiseshell shade, both from Vision Direct. These Gunmetal Metal Cork Aviator sunglasses from Animal are a good looking pair of glasses. The detailing on the arms show off the brand's historic surfing heritage while graduated smoke lenses make these sunglasses perfect for the beach or standing courtside. Mr.H has used these sunglasses and he finds them comfortable and stylish. The sunglasses come in a branded soft pouch. This Rechargeable Helix lantern is perfect for camping trips, in the tent or simply an evening in the garden. An industry standard micro-USB port powers up the rechargeable battery that allows this lightweight lantern to put out a bright beam that’s easy on the eyes. Practical and functional this lantern is perfect for the outdoorsy dad and will become an essential item in his camping pack. This one is for the beer loving dad! The Hydro Flask Growler keeps ales, ciders and lagers cold and carbonated for up to 24 hours. The concept behind the Growler is the same as the Hydro Flask water bottle. It is made with durable 18/8 Pro-Grade Stainless Steel construction and the TempShield insulation eliminates condensation and keeps brews cold for up to 24 hours. Candles are not just for the ladies. Even men love good scents. And who can deny that candles make a home more inviting. Yankee Candles have come up with candles made specifically for men. Recently, Mr.H got the chance to try two candles from Yankee Candle's Barbershop collection and liked them a lot. The Barbershop collection features scents like Hair Tonic, Hot Towel, Sandalwood and Chrome. The candles are presented in glossy black tumblers with brushed metal lids. Ending the list is a failsafe Father's Day gift suggestion - smart shirts (for the smart dad). Why not treat your dad to a smart shirt from Dobell's impressive range of smart and smart-casual work attire? Whether it is a classic fit or slim fit, or different styles such as a Cambridge shirt, Oxford shirt or a double cuff shirt you are looking for, you will find it on Dobell's website. Dobell's have shirts in a wide range of colours but I have picked two classic colours - black and ivory. The Dobell Black Shirt with Classic Collar (£19.99) is made from a cotton rich fabric. It is soft, elegant & simple and comfortable for all-day wear. Mr.H recommends - he found the fit perfect and the shirt ideal for everyday office wear. The Dobell 100% Cotton Ivory Shirt (£24.99) is made from 100% cotton and it is both durable and soft on the skin. The ivory colour is lovely and Mr.H found the fabric very soft and good on the skin. Check out the Dobell's website for not just shirts but also high quality suits, tuxedos and formal wear - all at unbeatable prices! All prices are right at the time of publishing.